Radio stood its ground with strong listenership figures as we wrapped up 2018, according to today’s RAJAR results. Radio is not only alive but adapting at speed, with evolving platforms, new presenters and a focus on tapping into younger audiences. There is so much more competition for people’s ears today than there was even just a year ago. Yet there’s still only 24 hours in a day to consume it. For today’s results to indicate that radio reach is stable proves there is demand and appetite in an increasingly crowded market. RAJAR findings from Q4 2018 show a small 0.4% decline in radio reach and 24 fewer minutes being listened to each week. 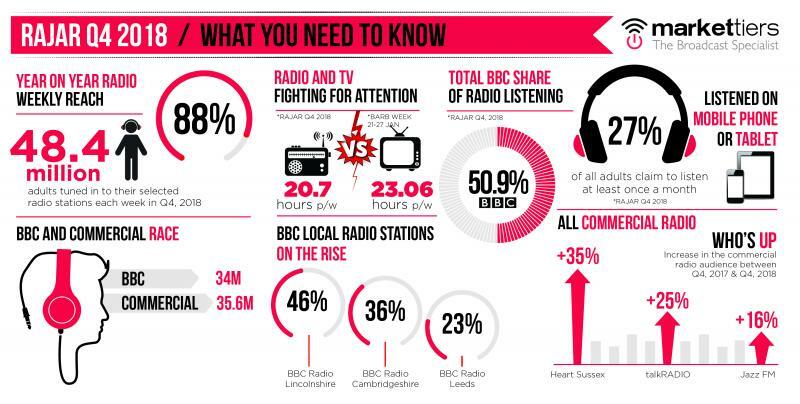 These figures alone might suggest that the radio industry is simply ‘surviving’. Yet in fact they only tell half a story. Radio is standing its ground but it’s certainly not standing still. When you dig a little deeper you realise it’s evolving to meet the needs of younger target audiences. To anyone in the radio market who isn’t adapting their approach to reach and engage new audiences, these latest figures should be a clarion call. With the ever-expanding competition of global channels, platforms and content to choose from many could easily underestimate the influence radio still has. In reality, no other medium, bar the internet, can claim to reach 68% of all adults at home, 64% whilst travelling and 22% at work or elsewhere. A true feat radio has consistently delivered year on year. In the last several weeks alone, BBC England’s Head of Audio and Digital, Chris Burns, announced that BBC Local Radio is changing its music policy to increase visibility in local communities, uncover and nurture new talent and appeal to younger audiences. The network of 39 stations is holding nationwide auditions to find new talent, from unconventional backgrounds to headline new shows. Radio is evolving because the way audiences are consuming audio and why they are consuming it is shifting. The latest MIDAS Survey shows listeners are embracing multi-platform and multi-device radio accessibility with nearly three quarters (74%) of all internet delivered audio consumed being live radio. Whilst this drops to 47% amongst 15 to 24-year olds, it still makes up the lion’s share of listening for that age group. It’s for this very reason the BBC launched BBC Sounds in October last year and why they have been promoting it so heavily since as the place to listen to live and on demand radio and podcasts. That launch and the subtle but very deliberate name change – from iPlayer Radio to Sounds - reflects and highlights how technology has impacted how we consume. Similar levels of evolution, and investment, are taking place in the commercial radio sector. Simon Mayo uncovered the soon-to-be launched Scala radio station backed by Bauer. A brand-new radio station created to take advantage of a gap in a strong radio market. A gap generated by the evolution of external social factors, including the use of classical music in gaming and the rise of mindfulness. Youngsters are looking for channels to tune into, in order to tune out the noise of the modern world and Bauer saw an opportunity. Whichever way you look at today’s results, no-one can deny that almost 100 years after the very first broadcast radio is still going strong in a media landscape being constantly invaded and reshaped. Maybe it’s about time it got the recognition it deserved.